I must pray. Not just “must” in the sense of duty (although this is a part of my calling as a pastor – Acts 6:1-7), but I must in that “apart from Christ I can do nothing” (John 15:5) and "this is eternal life" - to "know the only true God" and "Jesus Christ whom he has sent" (John 17:3). Just as Jacob always walked with a limp after wrestling with the mysterious character in Genesis 32, so also the Christian is in a sense ruined by the Spirit as far as her own efforts are concerned. We live in the tension of being called to do and be much in this world, and yet unable to do any good in our own strength. And so, as natural as breathing, the Christian prays. And yet… breathing is often much easier than prayer. Prayer takes time, effort, energy, focus, and discipline. The one who prays on the fly still prays, but does not necessarily pray well. As someone who is easily distracted and unable to sit still, I find prayer, although necessary, often difficult. I’m sure you do as well. I don’t claim to be very good at praying, but there are some formative influences that have shaped the way I pray. I share the following as one person weak in prayer offering some counsel to others who, perhaps like me, are weak in the discipline as well, but nevertheless want to grow stronger in the daily habit for the joy of knowing Christ and serving neighbor better. The following are three insight shared with me in recent years that have served as good direction in the path of prayer. I often struggle to articulate my prayers. How do I turn the Spirit’s groans and sighs into intelligible words? The Spirit has already spoken in the songs and prayers of Israel, Jesus, and the church – 150 unique, deep, and often raw cries to God called the Psalms. Each gives voice to what I am often unable to articulate. Cries of joy: “Bless the Lord oh my soul, and all that is within me! Bless his holy name! (Ps. 103:1). Cries of pain: "Turn to me and be gracious to me, for I am lonely and afflicted. The troubles of my heart have multiplied; free me from my anguish" (Ps. 25:16). Sighs of depression: “My tears have been my food day and night, while men say to me, 'Where is your God?'" (Ps. 42:2). Confession of sins: “Have mercy on me, O God, according to your unfailing love; according to your great compassion blot out all my transgressions" (Ps. 51:1). Joy in forgiveness: "As far as the east is from the west, so far has he removed our transgressions from us" (Ps. 103:12). One of my professors in seminary challenged us to pray each of the Psalms one by one. At first it was a daunting task. But then I began to savor the words as my own. I encourage you to do the same. You can jump in at number one and pray one or a few each day. Or, a number of excellent resources exist to guide you in your discipline. The Concordia Psalter offers a schedule (here's a review). You can also use the schedule from the Lutheran Study Bible or the Lutheran Service Book. I also appreciate Tim and Kathy Keller’s The Songs of Jesus – a series of 365 devotions on the Psalms, all of which are Christ centered and substantive. Which ever you choose, I have no doubt that your prayers will grow all the wider, richer, and deeper with the language of the Psalms. As you pray them, you join your voice with the prayers of God’s people from all ages – prayers spoken and sung by David, the exiles, our Lord Jesus, Paul, Augustine, Luther, and your perhaps your grandparents. I’ve heard it said that true learning involves going deeper with the basics rather than simply acquiring new information. Many will learn the Catechism as a matter of necessity in order to be confirmed or join a church, but then will lay it aside to collect dust. Luther, on the other hand, was in the habit of studying the Catechism every day. He enjoined others, no matter how advanced in their study of God's word, to do the same. One of the ways that Luther went deeper with the basics of the Christian faith was through praying the catechism. In his address to his friend Peter the Barber called A Simple Way to Pray, Luther outlines how he used each part the of Ten Commandments, the Creed, and the Lord’s Prayer as a springboard for prayer. For example, with each commandment Luther employs a four-fold method. First, he acknowledges what the commandments teaches Then he gives thanks for what it protects and guards. Next, he uses the commandment as a guide in confessing his sins. And finally, Luther prayer for the gift of the Holy Spirit to aid in the keeping of the commandment. In recent years I’ve found praying the Catechism each day as an incredibly simple way to keep the rule of faith confessed by the church in front of my eyes and in my mouth. The result is that I feel better equipped to teach the faith to my congregation and my family, and even defend the faith in everyday conversation. Additionally, I end up covering ground that I know is important to God rather than getting lost in my default selfish and repetitive prayers. How do you do this? All you need is a copy of Luther’s Small Catechism. But I also recommend that you give A Simple Way to Pray a quick read (here's a PDF version), as well as the recently published book by John Pless, Praying Luther’s Small Catechism. Weeks and months of prayer recorded on paper give insight into the work of the Holy Spirit in my own life and the lives of those around me. For years I used to keep meditations and prayers written out haphazardly in a series of poorly organized notebooks and sticky notes. In the last few months I was encouraged by a friend of mine in ministry to keep a daily prayer journal in a single notebook (see this post on “how to”). This journal sits on my desk at church, and then goes home with me on my day off. This practice has been incredibly helpful for a few reasons. First, the practice helps me in the task of oversight by keeping the various groups at church in front of me with prayerful intentionality. Second, I am able to look back and see God’s responses to individual petitions. And finally, praying with purpose and discipline helps lean forward toward the future with joy and expectation at what the Spirit is doing among God’s people. I use the journal specifically for my calling as a pastor. However, the journal could just as easily be applied to family members, neighbors, coworkers, or current events. 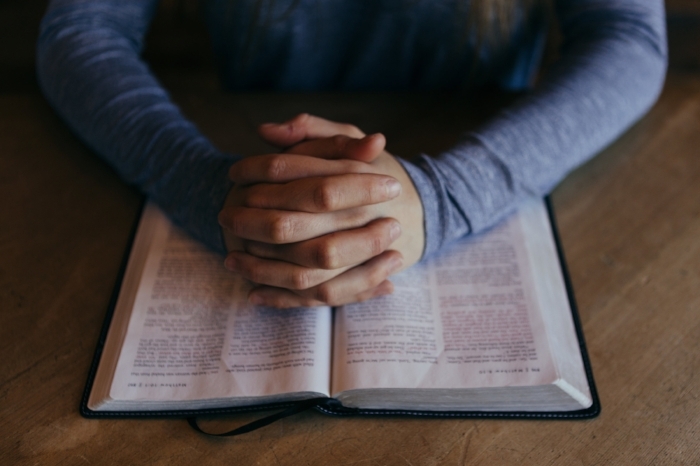 I am in no way perfect in my prayers, and perhaps in years to come I will follow a different set of practices (however I can’t imagine ever praying without the Psalms or the Catechism!). But I pray that these three practices will aid you in your desire to follow Paul’s encouragement to “pray without ceasing” (1 Thessalonians 5:16). Oct 26 Reflections on the 2016 Erasmus Lectures - "Can the Religious Right Be Saved?" Jun 1 Begging for Bread: How Do I Read the Bible?